We have events planned! Please mark your calendars! After the disastrous election of 2016, where do we go from here with electoral politics? Stick with the Democrats? Go with the Greens? Abstain? Or build a new type of independent electoral effort responsible to a mass movement? Here a debate among representatives of different viewpoints and participate in the discussion. Spanish translation available (bring your cellphone!). Trump seeks to divide us, to rob us to make the rich richer. We refuse to fight over the crumbs that the billionaires leave us, race against race, men against women, citizen against immigrant. Instead we will unite to demand what we ALL need. We need to take the cake, not the crumbs. We need to take it away from the rich, from the corporations, from capitalism--take it to build the world we want. We—workers, students, immigrants—do the work. If we unite, we have the power to change the world! A democratically-controlled federal public works and public service program to provide free education (through college), free healthcare, free housing, free transportation and free clean energy FOR ALL. The program will have direct government employment with good wages and reduced hours. Fund the program by taxing the wealthy and corporations, slashing weapons spending and ending all US wars and occupations. Through this program, provide environmentally-sustainable jobs and training FOR ALL who want them, including all immigrants and the formerly incarcerated. Equal rights FOR ALL who live here, including the right to vote. End all deportations and detentions without charge. End mass incarceration. Unconditional defense of the rights of women to control their bodies, and of the rights of all, regardless of race, religion, birthplace or any other distinction. Unlimited right to unionize, to organize and to strike. Nationalization of all finance (banking, insurance, etc.) under democratic control. To win these demands, we need a movement independent of the Democrats and Republicans. Winning them means taking the first giant steps from capitalism to socialism, sweeping away the racism, sexism, nationalism and other oppressions that have been used to divide us. Winning them means moving from the Power of the Few to the Power of ALL. Click for more information on these demands and why we need to win them. Mitch Landrieu and his Walmart, Entergy, Rockefeller Foundation, and other capitalist ï¿½partnersï¿½ are putting on their ï¿½Katrina 10: A Resilient New Orleansï¿½ commemoration to cover up the ruling classï¿½s crimes. Come to a Peopleï¿½s History of Katrina Conference to hear the truth about the capitalist crimes inflicted on New Orleansï¿½ working class, the resistance to these attacks, and the continuing liberation fight against capitalist destruction and for a real working class reconstruction of New Orleans, the USA and World. The battle for a jobs program in the 1930ï¿½s and the sit-down strikes of 1936-37. Sunday, April 17th 3:00 to 6:00 PM St. James Church, Newark 143 Madison St., Newark (enter through parking lot). WEDNESDAY APRIL 27 AT 7:30 a.m.
Donï¿½t let Wanderson DaSilva be the Next Victim of Injustice! US Immigration laws are unconstitutional! Nowhere in the Constitution is Congress given the right to condemn people to exile just for the ï¿½crimeï¿½ of being born elsewhere. No law that Congress has passed makes being here without proper documents into a crime. And if it were a crime, defendants would have the right to be tried by a jury of their peers. Meet at the corner of Van Buren and Walnut Streets. Today, one in six Americans is unemployed or underemployed, and one in four is among African-Americans and Latinos. Public workers are under attack and education, health and other vital public services are being slashed. Today, there is only one way to create jobsï¿½the government must hire workers directly at good pay to do the work that needs to be done. The public sector needs to be vastly expanded, not cut! NJ Immigrant and Worker Rights Coalition will be having its next meeting Sunday, December 12 at 2:00 PM at St. James Church, 143 Madison St, Newark (cafeteria, enter through the parking lot). Please send your agenda items. 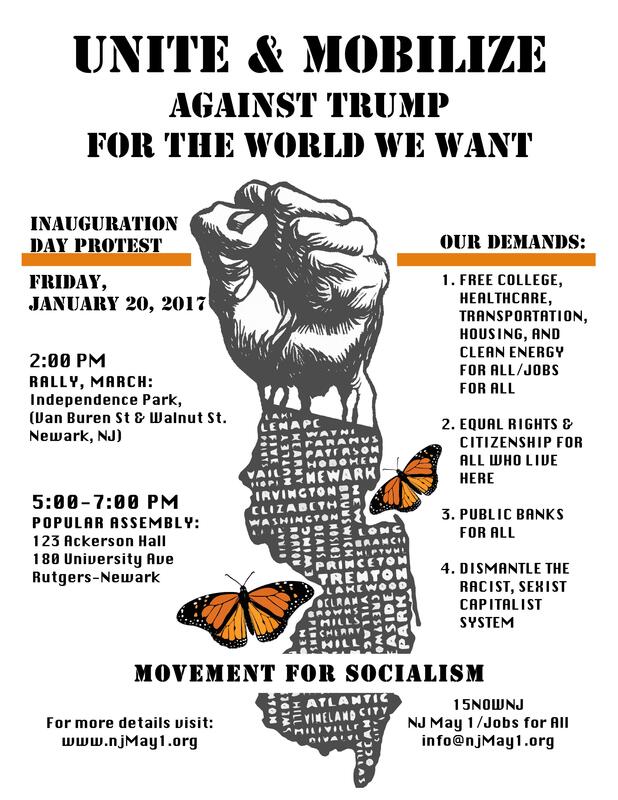 Agenda items include planning for NJ Conference on Jobs for All, Legalization for All January 29-30, possible March demonstration (Elizabeth or other), May 1 event, possible independent electoral campaigns in 2011 and plans for expanded outreach. There will be an important state-wide meeting of NJ immigrant rights groups, unions and community groups on Sunday, September 12, 2:00 to 5:30 PM at St. James Church cafeteria, 143 Madison St., Newark (enter through parking lot). This meeting is open to all.The meeting has the goal of reaching an agreement among all of us on demands, future actions and a more permanent way of cooperation, such as a state-wide coalition. As of this writing activists participating in this meeting include those from the following organizations (partial list in formation, alphabetically) : Casa Freehold, CWA Local 1032, Day Laborers of Freehold, First Friends, IRATE, Jobs for All Campaign/NJMay1, Jornaleros Unidos of Passaic, NJ Dream Act Coalition, Pax Christi-NJ, Wind of the Spirit. Please send us any additions or corrections to this list (info@njmay1.org). The next study group on the history of the workers movement will be held Saturday, March 6 at 2:00 PM at at Alvarez Cafe, 511 Elizabeth Ave., Elizabeth NJ.We will start looking at the main trends that all claimed to derive from the work of Marx: reformism, Leninism and Luxemburgism. One reading is excerpts from Rosa Luxemburgï¿½s pamphlet Reform or Revolution (1898). (Feel free to read the whole thing!) The second is an article from the current issue of Mass Strike relating the debates between Lenin and Luxemburg to the present day.